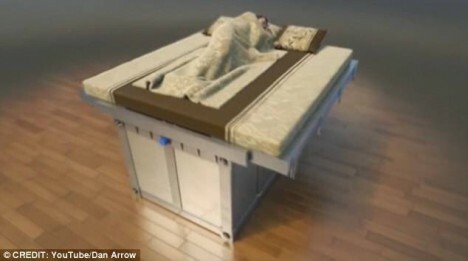 It is hard to say which would be scarier: waking up to an earthquake, or to being trapped inside of a jumbo coffin-like contraption containing your bed and emergency supplies. 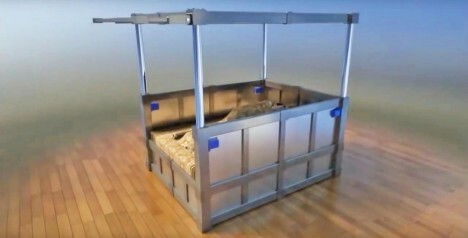 Wang Wenxi developed and patented this bizarre panic-room bed prototype, which drops a top and side on your snuggly shelter when disaster strikes (or, in certain variants: drops you down into a solid shell, with the lid folding over the top after your fall). 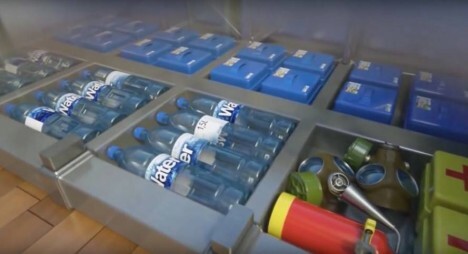 Food, water, masks and fire extinguishers are contained in the bed frame as well, and the structure itself is designed to take a beating as well as loads from above. 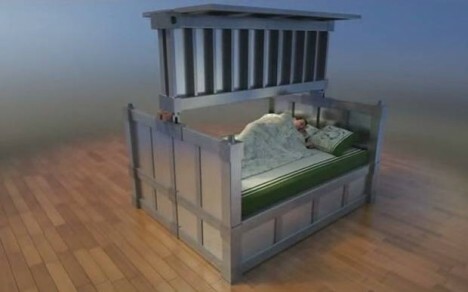 Of course, there are a lot of criticisms one could level at this design, including: it would be difficult to move the bed inside of a home to begin with, and one could be injured by the closing operation (say you like to sleep with your feet hanging off the edge). Then, assuming one survives, how long will the air inside last, or will you slowly suffocate your in your modern sarcophagus to be found years or centuries later by curious archeologists? If all else fails, perhaps the patent holder will find success at a different scale, designing animal traps instead of human shelters. See more in Home & Personal or under Gadgets. January, 2016.